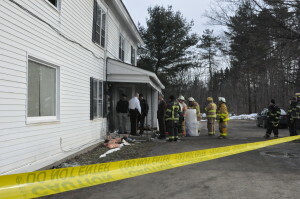 Police arrested two Saratoga County men for intentionally starting a fire at an apartment building at 44 Mettowee Street in Granville early Monday morning. Both 44-year-old Stephen J. Gyarmathy and 57-year-old Joseph L. Guerrier, of Porter Corners, were charged with second-degree arson and first-degree reckless endangerment for their act, which left at least 11 people temporarily homeless. Residents of the four apartments awoke to the sound of a fire alarm and called 911 after seeing smoke in the common hallway. Firefighters were first called to the scene at 1:57 a.m. to a structure fire, but Deputy David Buxton, of the Washington County Sheriff’s Department, was first to arrive on the scene, said Ryan Pedone, Granville fire chief. He was aided by T.J. Zovistoski, an off-duty Granville police officer. The two located a fire burning at the base of the rear stairwell to the upstairs apartments and began walking the residents on the ground floor and evacuated the second story rear apartment, police said. There were five occupants on the roof, who could not exit through the stairwell because it was filled with flames and smoke. Responders were able to get those people safely on the ground with a ladder. Pedone said Buxton was able to use a fire extinguisher to contain the fire, so crews were able to knock it down within 15 minutes of arriving. The spent additional time checking for hot spots and had to break some of the building’s windows in order to completely stop the fire. Sergeant Dave Williams, of the Granville Police, said both the tenants and responders could smell gasoline on the scene, so they immediately knew the fire was suspicious. It didn’t take long to figure out what had happened. About an hour before the fire started, Officer Zovistoski had been heading home from a rescue squad call and notified police when he noticed a vehicle with one taillight out driving erratically in Hudson Falls. Desmond Lyons, of the Hudson Falls Police, pulled the vehicle over and determined that the driver, Guerrier, and the passenger, Gyarmathy, were not intoxicated. However, upon checking Guerrier’s license he discovered the man was on parole from prison time for previous murder and grand larceny charges. Lyons also asked the men about a gasoline canister he noticed in the back of the car. The men explained they were on their way to an emergency plumbing job in Granville, though it was 1:07 a.m. They even showed Lyons the Mettowee Street address where they were headed on a GPS they had in the car. It wasn’t too difficult for police to connect the dots when they were searching for their suspects that afternoon. Pedone estimated 10 to 15 people had been in the building, and owner Gary Jurnak said nine adults and two children lived inside. The Red Cross is currently putting them up at the Panorama Motel on Route 22A. Granville and New York State Police were able to locate and interview Gyarmathy and Guerrier, who eventually confessed to their involvement in the fire. It turned out Gyarmathy was upset with an upstairs female resident, whom he had previously dated. He was concerned he might soon be facing jail time and did not want the woman to have more custody over their child. He also had a previous felony conviction. “They said they were coming to put sugar in her gas tank, which damages the car. They didn’t bring sugar, but they brought gasoline,” Williams said. Police have determined, though, that Guerrier dropped Gyarmathy off and waited while he ignited gasoline he had poured at the base of the rear stairway, which is the only exit for the upstairs apartment, up the flight of stairs and onto the landing of the exterior porch. Guerrier, who owned the gas can, said he did not know his partner had grabbed it and set the building on fire; he maintains he thought he was only “sugaring” the ex-girlfriend’s car. Gyarmathy has given similar statements. An insurance adjuster already came to the scene, and Jurnak said workers have begun repairing the damage. In addition to replacing the staircase, he said they need to replace wiring, sheet rock and some broken windows. “We’re going to try to get them back in as soon as we can,” he said, estimating the tenants can return as soon as repairs are finished and code enforcement approves. Jurnak, who was notified of the fire at about 2 a.m., said he is glad everyone got out safely and is grateful for the firefighters’ aid. “I appreciate the quick, overwhelming response of the fire companies — they got it under control quickly,” he said. Pedone also said it was a “very, very quick knockdown.” He said crews from Granville, Middle Granville, North Granville, West Pawlet and Pawlet were on the scene. Police are in discussion with the Washington County District Attorney’s office about upgrading the suspects’ charges. The two were arraigned in front of Village Justice Paul Manchester and remanded without bail to reappear in court at a later date. Granville police were assisted in the case by New York State Police, New York State fire investigators, Washington County fire investigators, and the Washington County District Attorney’s office.